Just south of yesterday's State Route 37 Bridge is the lift bridge onto Mare Island (which is more like a peninsula) on the west side of the Napa River. People can get on and off the island using these two bridges. In this photo I'm standing atop the west tower of the new Carquinez Suspension Bridge looking up the Napa River, which empties into the Carquinez Straits. 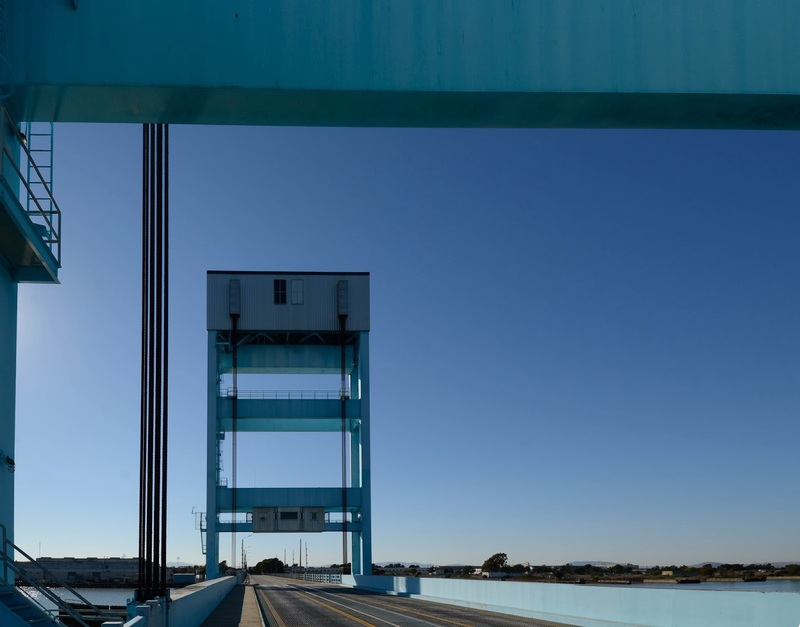 The Mare Island Causeway was built in 1934. The bridge is 2008 ft long with a 165 ft long main span. It has long concrete trestle approach spans and a steel lift main span. It's only 30 ft wide. The lift span is normally in the closed position. It has 20 ft of vertical clearance on the deck and over 100 ft of vertical clearance across the channel when the lift span is opened. 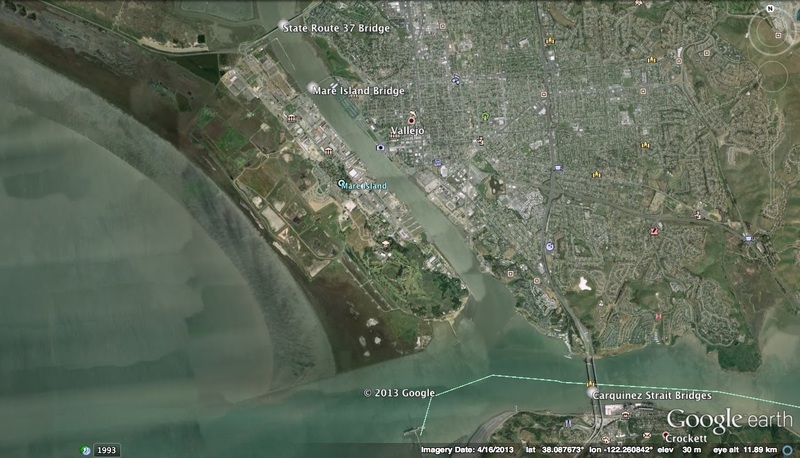 Mare Island seems to be going through an economic depression. For over 100 years, it was the main Naval shipyard for the United States. In 1995 it was finally closed during the big round of base closures. Now there are many empty factories with broken windows. However, many entrepreneurs have bought the old factories for new ventures. For instance, Victor Zayas has a factory that builds friction pendulum bearings on the island. 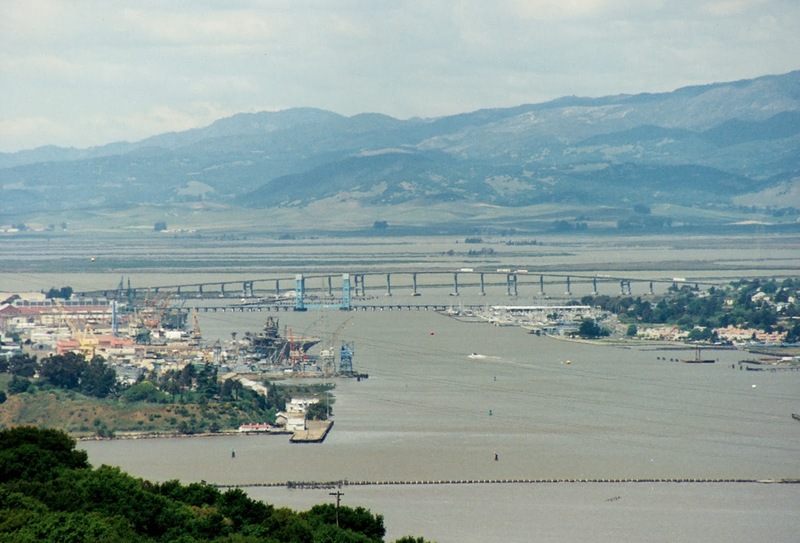 Solano County, California Bridges: Mare Island Causeway across the Napa River by Mark Yashinsky is licensed under a Creative Commons Attribution-NonCommercial-NoDerivatives 4.0 International License.